Supply conditions aside, the .22 Long Rifle is the undisputed champion when it comes to teaching humans how to shoot. I used the term "humans" because I think our aversions to recoil and muzzle blast are traits that take us back to the core of our speciesâ€”we are naturally scared of explosions. No matter how hardened you are to recoil, I'd bet you my best handgun you shoot a rimfire better than you do any other firearm. Under normal conditions, .22 LR is inexpensive and available, making it the perfect choice to create the muscle memory for proper sight picture and trigger squeeze. Combining those fundamental shooting elements into the size and feel of a large-caliber handgun can help both novice and advanced shooters master their pistolsâ€”that's why I was eager to try out the Tactical Solutions TSG-22 Glock Conversion Kit. The TSG-22 is basically a replacement slide assembly for Glock handguns. There are two basic models: the 17/22, which is compatible with all full-size 9x19 and .40 S&W Glocks, regardless of generation (models 17, 22, 34, 35, 37) and the 19/23, which fits the mid-sized Glocks (19, 23, 32. 38). At this point, there are no models designed to work with .45 ACP, 10mm or subcompact Glocks. The TSG is installed by removing the standard slide assembly from your Glock and replacing it with the TSG slideâ€”it literally takes seconds. Trade the standard centerfire magazine out for the TSG's rimfire magazine and you're ready to shoot. Disassembly is a bit trickier and always takes me a few tries to get the takedown to engage, but this has improved with use. The most important and attractive attribute of the TSG is its external similarity to the standard Glock slide assembly. Its dimensions are the same, and the cocking serrations are identical in placement and designâ€”the TSG feels just like a full-sized Glock and even fits in the same holsters. The sights appear to be factory Glock polymer sights and use the same sight radius so the sight picture is identical. If you have aftermarket sights on your Glock, you can also fit a set to the TSG to keep things consistent. The only major difference between a stock Glock and a rimfire conversion-equipped Glock is weightâ€”the TSG's slide is roughly 6 ounces lighter than the slide of a Glock 17. Honestly, I didn't find the weight difference to be noticeable. In fact, I didn't realize it until I weighed the slides on a scale. The TSG looks, feels and shoots like an unmodified Glock, but has far less recoil and uses less expensive ammo. The magazines are the same size externally as Glock 17 magazines, so they fit in standard mag pouchesâ€”which is beneficial for practicing reloads and performing malfunction drills. 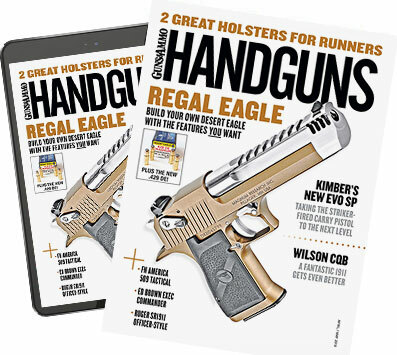 The magazines are available in both 10 and 15 rounds. Since I didn't have a Glock 17 on hand, I fitted the TSG kit to the Glock 34 I use for USPSA matches. Aside from the shorter 17-length slide, the setup was almost identical to my standard G34. The only issue I encountered was an increase in trigger pull weight when using the conversion. My G34 is equipped with a 3-3/8-pound aftermarket trigger, but the trigger weight increased to 6.5 pounds with the TSG installed. My guess is the increased weight is due to the aftermarket parts installed in the firing pin safety/assembly as part of my trigger modification. This increase in trigger weight does not appear to be an issue with standard Glock triggers. On the range, the trigger pull weight wasn't much of an issueâ€”I shoot a variety of different firearms on a regular basis, and adapt quickly to changes. Tactical Solutions specifically recommends CCI Blazer, CCI Mini-Mag HV and Federal Game-Shok 40-grain solid ammunition in the TSG for maximum reliability. You won't be shocked to hear none of this ammunition was available while I was testing this product, so I used what I could find. I tested the TSG using Remington Golden Bullet 40-grain jacketed round nose and Yellow Jacket 33-grain Hyper Velocity JHPs, despite the manual's warning against the use of hyper-velocity ammo. The TSG was 100-percent reliable using the 40-grain ammo, and worked surprisingly well using the 33-grain loads. It's safe to say any reliability issues I experienced were due to my flagrant disregard for the manufacturer's instructions. Accuracy was as good as the host firearm's performance with 9mm loads, which is typically better than what the shooter is capable of. The sights were well regulated to the point of impact when the recommended bullet weight was used. Dry-firing is a great way to master a handgun but, it can't replace putting in the repetitions of actually firing the gun. With the TSG conversion, you get the physiological response of having some recoil and noise, combined with the mechanical function of resetting the trigger without constantly racking the slide. Add the fact that you are actually throwing rounds downrangeâ€”actually hitting or missing a targetâ€”and you've got all the elements of a great training tool. Despite the lack of large caliber power, the TSG conversion works exactly like a standard Glock, and the slide even locks back on an empty chamber. I don't care who you are, putting a brick of .22s through your Glock on a regular basis will make you better with it. I have recently taken many months away from shooting matches due to other obligations, and my shooting and manipulations have suffered. The ability to use the TSG in conjunction with my standard belt, holster and mag pouches was a valuable tool for bringing my shooting and reloads back up to snuff without spending hours at the loading bench making 9mm. We are living in a trying times right now when it comes to ammo availabilityâ€”this is the only time in recent history in which rimfire ammunition has become unobtainable due to consumer demand and hoarding. Fortunately, I spent some time last week with Remington's Senior VP of Ammunition, Keith Enlow, who assured me the rimfire lines at Remington's Lonoke, Ark., plant are running full-blast, 24/7. When the billions of rimfire rounds rolling off the lines of the major ammo makers finally quench the market's appetite for the .22 LR, the rimfire cartridge will regain its rightful place as the ideal practice round. A factory-made Glock chambered in .22 LR would probably sell like crazy, but I don't foresee one in the pipeline. The Tactical Solutions TSG-22 is about as close as you can get to owning a rimfire Glock, and it's made in the U.S.A. Whether you're looking for a cheaper way to practice with your handgun, want to introduce a beginner to handgun shooting or just hate recoil, if you're kicking the tires on a .22 conversion, this one will suit your needs.